In 2011, House Speaker John Boehner established what would become known as the “Boehner Rule”: he said any debt ceiling increase would have to be offset by spending cuts. On Tuesday morning, Boehner stunned Republicans by announcing that he was dropping a package that would have tied the debt ceiling increase to a repeal of cuts to military retirement pensions that were approved in December and replacing it with a “clean” debt ceiling increase. In other words, Boehner is allowing the debt ceiling to be suspended without any concessions from the Democrats. In recent years, conservatives fought to get at least some spending cuts, to begin putting the budget on a path to balance—after all, raising the debt ceiling means Congress has spent too much. Cutting spending before increasing the debt limit is necessary if Congress is to exercise some control over the debt. But not this year. No one put up a fight this time—so Congress is essentially handing President Obama a blank check for the entire year. The bill, which has been approved by the House and the Senate, does not raise the debt limit by a set amount but instead suspends it through March 15, 2015. This gives the Treasury Department the leeway it needs to borrow money to pay for Social Security checks, payments on government debt and paychecks for federal workers. It’s true that Republicans did at least force Barack Obama, Harry Reid and Nancy Pelosi to own this debt ceiling suspension. The House bill passed with near unanimous Democratic support and only 28 House Republican votes. Democrats seemed to believe that voting for a clean debt ceiling extension with no reforms attached is a badge of honor, and we will see in November if voters agree. This vote breaks a longstanding and nonsensical convention that the majority party supply most of the votes for clearing a debt extension bill. 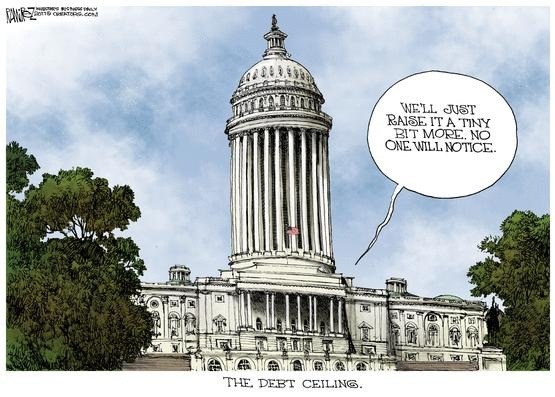 Obama ran up the debt by $6 trillion in five years, his party bears the responsibility for raising the debt ceiling. So that is a positive development. By the way, the national debt, at $17.3 trillion, already exceeds $140,000 per household. Plenty of sunshine dark times headin’ our way.